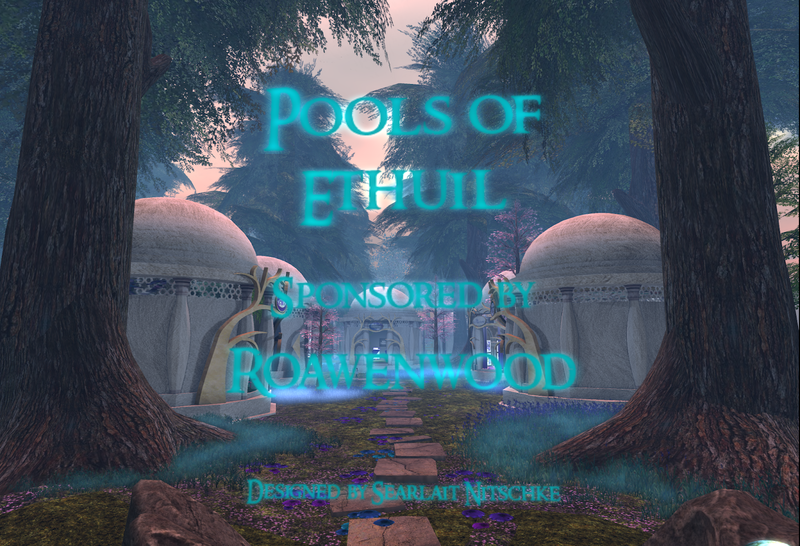 Donations to Relay for Life have been phenomenal this year and the Lindens have given us an extra week to shop, explore, Quest and create havoc in the Fairelands. So... Day 10 + 1 finds us exploring. 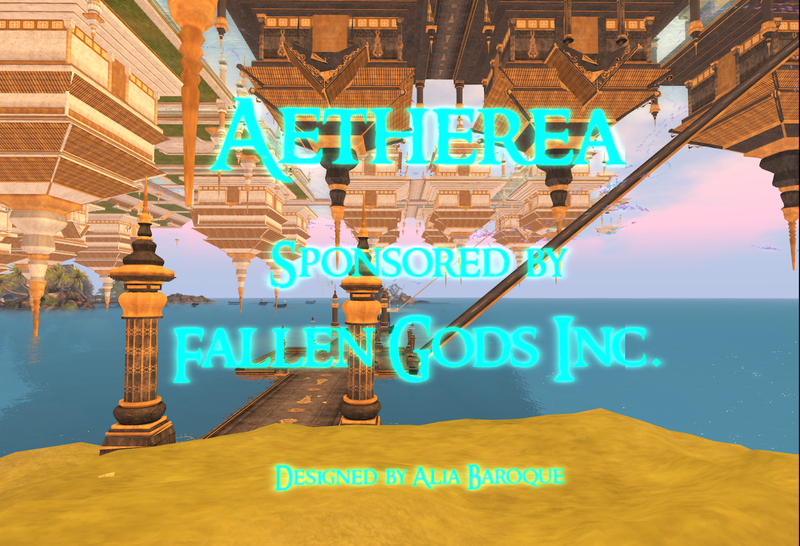 I mentioned Aetherea in my blog yesterday. In true enchanted-land style, Aetherea was not easy to find during the first part of the Faire. Technical issues plagued the sim and it kept disappearing until finally it was totally rebuilt. Please visit this lovely sim which combines the best of fantasy with the ethereal quality of a Japanese watercolor painting. 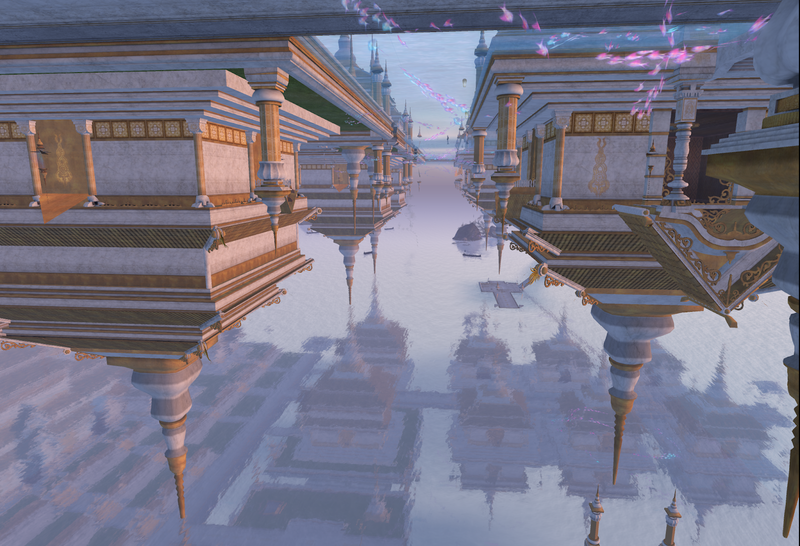 Things float in the most fantastic ways here and the reminders to keep all things in balance can be seen everywhere in the architecture and the decoration. This was the home of the infamous capture and release of the Skincarver, Alia Baroque, who took time from doing damage control to raise donations for Relay for Life via a Limited Edition skins sale. The sim was packed to capacity and people strained against the sim lines awaiting the chance to get in. Fallen Gods fans danced as the eternal battle of whether to purchase a light skin or a dark one was often resolved by purchasing both versions. All purchases were donations to Relay for Life so it was all good. One question I get every year is, "Is there anything for the GUYS?" I'm happy to report there are items for guys at Fantasy Faire. Bear in mind that we're talking Fantasy Faire. You won't find jeans or tee shirts here, nor sneakers, bikes or fast cars, but if you like cloaks, doublets, swords and metal head gear, this is the place for you! 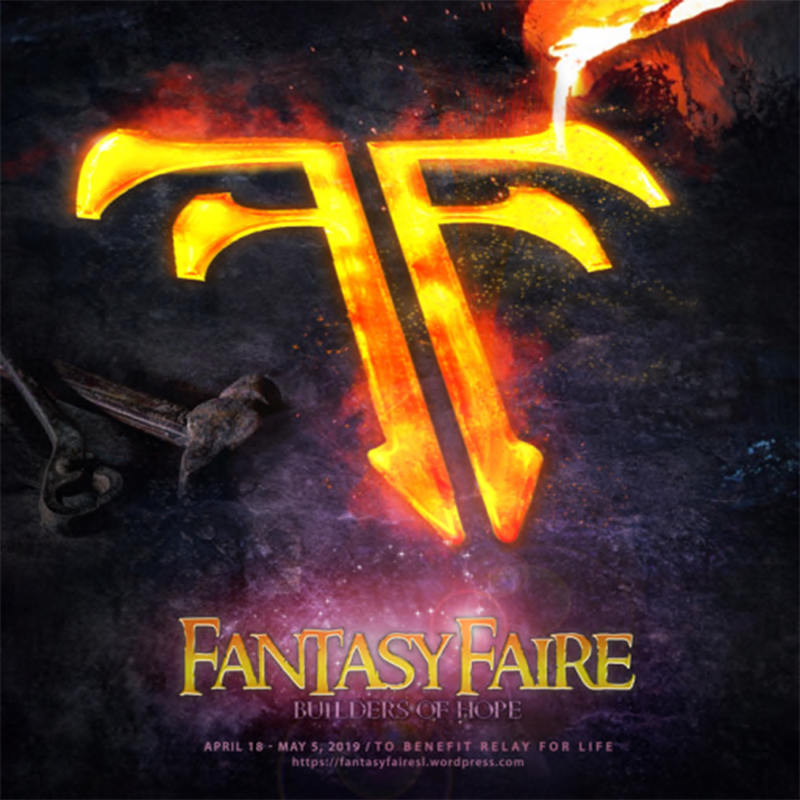 Fantasy Faire will be open for shopping and for the Quest till May 7, so there's still time to find what you're looking for to enhance your RP or fantasy Second Life. And don't even get me started on the fantasy skins or the CREATURES you you will find! If Game of Thrones, Vikings or Lord of the Rings sound like your binge watch list, take a walk through some of the shops in Aetherea. 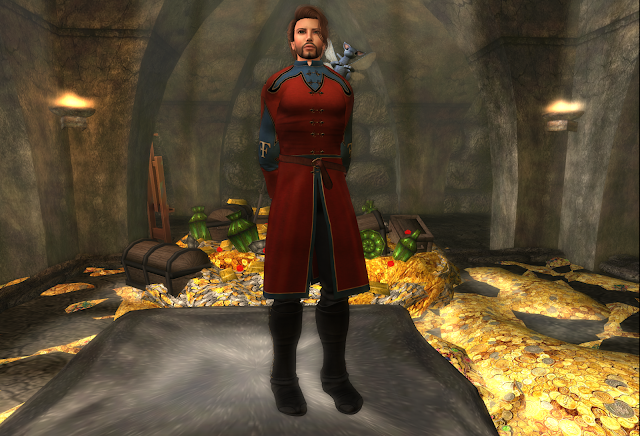 It seems that most of the men's clothing is located in this sim, though there are men's items throughout the Faire. ... and BTW, some of the sexiest guys I know wear leather kilts while riding their motorcycles, or their zebras...! 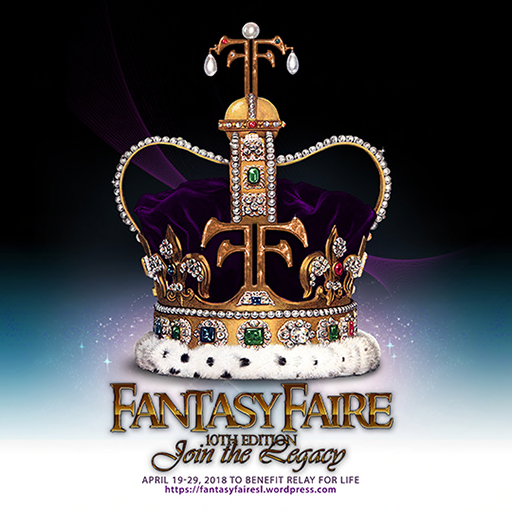 First of all, BIG news: In case you haven't already heard, the Lindens have made good on their vow to give Fantasy Faire another week! 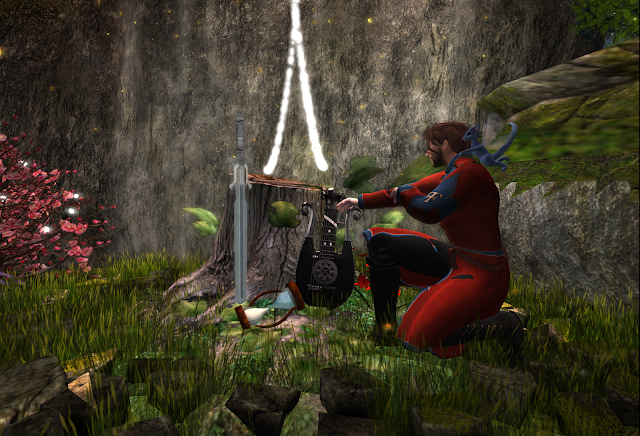 Official programming will end with an all-day dance April 30, but the Faire will remain open until May 7 for shopping, exploration and to allow everyone to complete the Quest. I can tell you from past years' experience that the spontaneous parties and shenanigans that take place after the Faire are every bit as fun as the planned activities, so please continue to visit and continue to support Relay for Life by purchasing LE items from the RFL vendors. 100% of sales from the special vendors goes to building the Hope Lodge in Nairobi, Kenya. 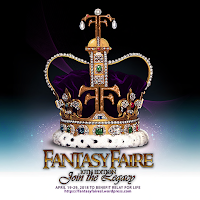 That being said, let me tell you about a Fantasy Faire special program coming up this weekend that you won't want to miss. 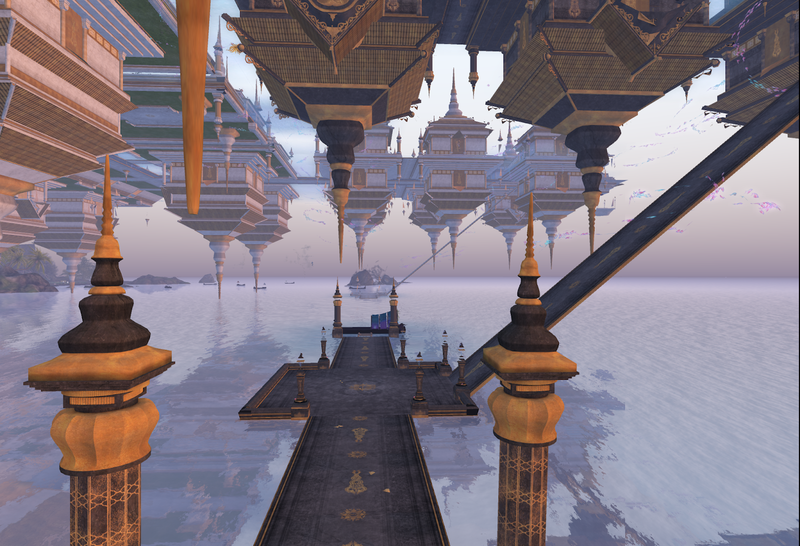 FlyGearZ is different from anything you've ever seen/done in SL. It's music, it's dance, it's a lot of fun, but it isn't exactly a show. Kiran Sporg and Jenna Dirval are SL choreographers, who, not being content to work with people who consider themselves dancers, decided to do actual choreographed numbers for the average SL resident. Instead of practicing for weeks and then putting on a stage production for an audience to watch, they ask the audience to join the dance and everyone in the dance hall is part of the show. 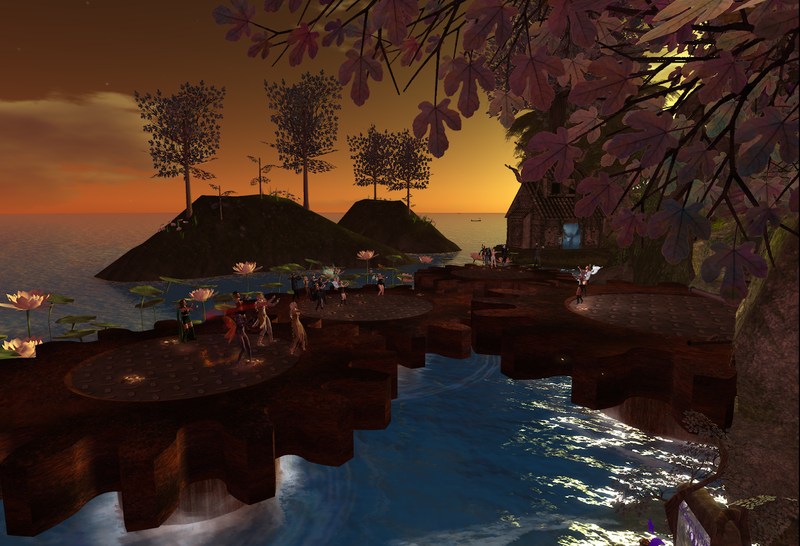 I've been hostess for FlyGearZ since they started a few years ago and I have a wonderful time watching SL residents who never considered themselves performers, suddenly turn in to professional dancers high kicking and spinning their way through complicated routines. 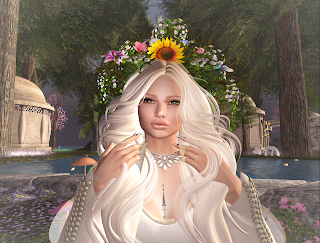 I hope you'll be able to join us Saturday, April 28 from 4-5 pm SLT @ Astrid's Nemeton. Wear fantasy or steampunk if you have it. It makes it even more fun. We'll see you there! Okay, okay, so one can walk on the stepping stones or TP in... Work with me will you? 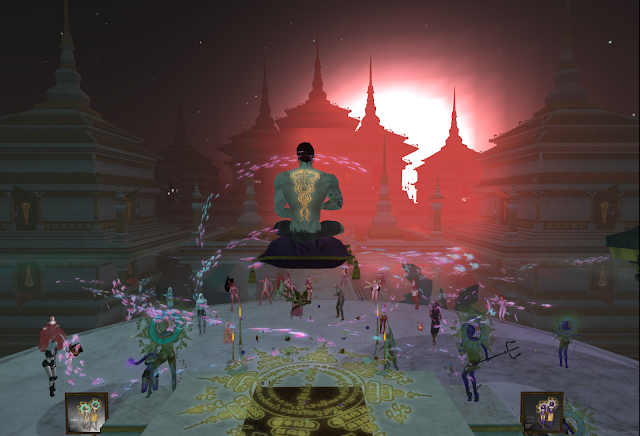 The Story Well is Fantasy Faire's Arts & Entertainment sim. 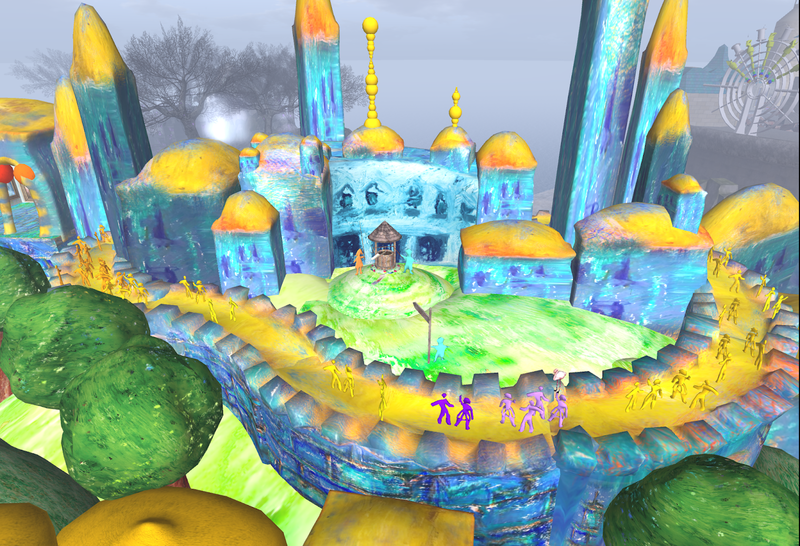 It features the Main Performance Stage for Dance, Music, Theater and Particle Performances. 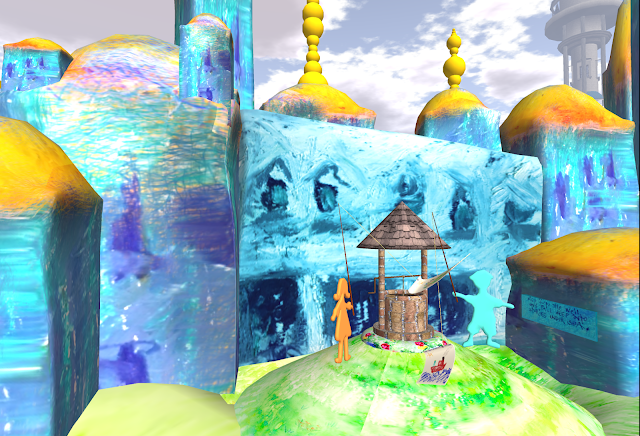 It is also the secret entrance to the realms under the sea, where fantastic creatures dwell and where the young artists who created the world above can let their imaginations soar free without the constraints of time or gravity. 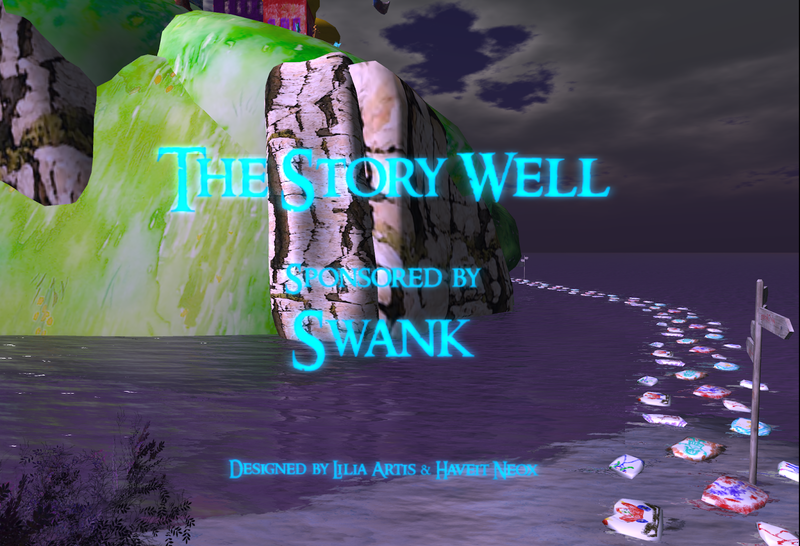 Grab your diving gear or don your mertail and jump into the beauty of the Story Well. What color is your crayon? Here there be elves, or at least elves could be very comfortable here with all the trees and running water. 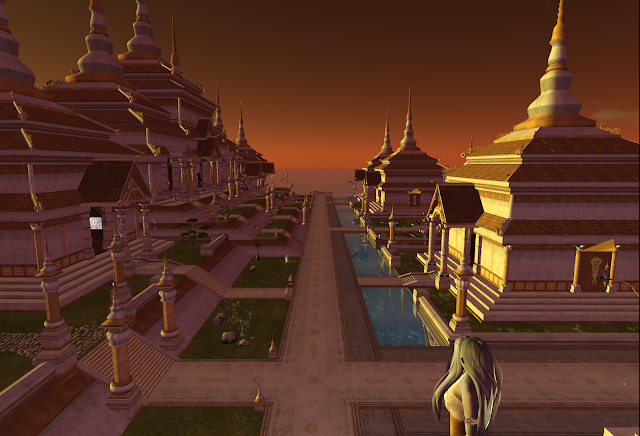 I visited the sim very early in the morning (7 a.m. slt) and I seemed to be the only elf around. 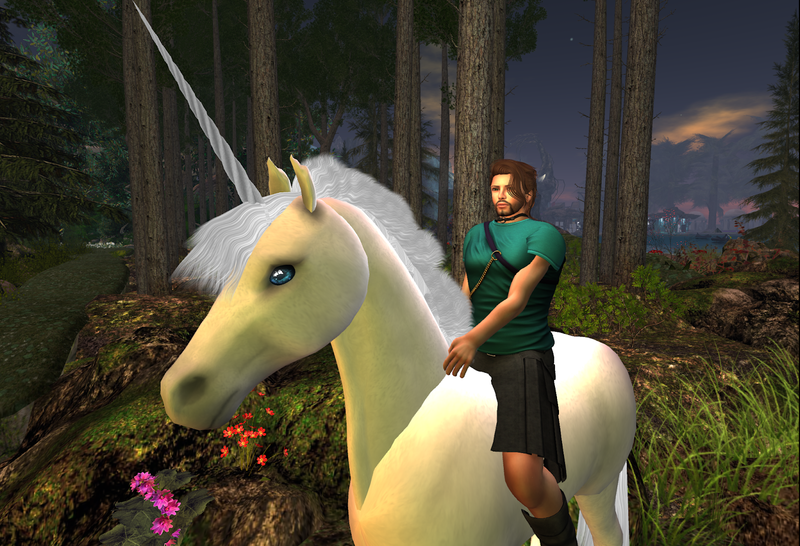 There was a friendly unicorn, but he was busy trimming the grass on the other side of the pool. My friend, Astoria, will DJ Thursday for one of the Writer's Workshops to be held at the Pools of Ethuil, presented as part of the Literacy Festival. Join us! You may find you have a talent for spinning a tale or penning a poem. If you've ever wanted to try your hand at writing, check the schedule HERE. Shoes ~ [QE] Designs Gai Heels Light [12 colors each for shoes and spikes / Belleza, Maitreya, Slink] From the Saturday sale @ the Main Store. Items usually stay on the sales boards for a week, so visit now!